We all suffer from this fear. Probably even Rupert Murdoch suffers from it. One of the greatest fears of lack is fear of lack of money. That’s a big one for a lot of us. There’s an argument to be put that fear of lack in fact is a positive motivation for you to get out and do things – to be more productive. That it spurs you to create, and that it’s like a cattle prod that kicks you into gear, or keeps you energised. Keeps you focused. Then there’s the fear of lack of love. We all have this fear too. We have a need to be loved. But some of us fear that love being withdrawn from us – through death, or through separation, or because we don’t trust it. And so we push it away. We push away those that are trying to love us, because we don’t read the signals right, or they don’t express their love in a way that we understand, or can fully appreciate. Then there’s the fear of lack of potency. This is most clearly reflected in our being scared of growing old. We hanker for our youth, when we believe we were at our most potent, whether that potency is reflected in physical strength, our capacity to love, our capacity to provide for those that we love, our capacity to be capable and competent. At the basis of this fear of lack is our mistrust that we will be provided for, that we will be nurtured, that everything will be okay. Perhaps we’ve had some bad experiences, and it’s tarnished our glass-half-full approach to life. We now see the glass as being cracked, and leaking like a sieve. Rupert Murdoch I suspect might wake up in the morning, in luxurious surroundings more magnificent that we can ever comprehend, and he might have gnawing fears just as we do. Does his wife love him (clearly not), do his children love him (depends on his how his will is written? ), is he getting too old to run his company proficiently, are his shareholders happy with the way he’s running things? None of us, no matter how rich or powerful, are protected from our fears of lack. If we fear lack of money, then we’ll go into lock-down mode. We’ll become tight and defensive, we’ll be anxious, we’ll become moribund with fear, we won’t spend, and we’ll close ourselves to opportunities and possibilities. Our anxiety and our fear will push people away from us. Some of those people could be existing clients, or people offering business opportunities. But who wants to work with someone who’s always uptight and scared of being poor? As well, our fear mentality will close down our creativity, and our capacity to produce and originate new ideas, new products. In other words, we will attract what we fear the most – we will attract a diminution of income streams. We will lose money, we will lack money, because that’s what we’ve feared. If we’re scared that we won’t be loved, or that we’re not loved, then we’ll become aggressive, or maudlin, or we’ll lose sight of our true nature and try to be something we’re not so that we can grab or cling onto the love that we seek. And in doing so, we’ll push away that love. It won’t come near us. Who wants to love someone that believes no-one loves them? Same with potency. We all grow old. We all lose our physical strength, our youthful good looks. Our bodies lose their firmness, our skin becomes wrinkled. There is nothing we can do about this, other than stave it off for a while with cosmetic surgery. But that’s just the outside. There’s no cosmetic surgery for growing old on the inside – for holding onto crusty old fashioned beliefs. For thinking we’re old. The only way to combat that is to change your thinking. See yourself as young, as being potent. Work a little harder to keep up with things. Don’t allow yourself to become old. You can make a choice in the morning. Are you going to wear jeans, or are you going to wear track pants? What the Camino teaches you is that you will be provided for. It will keep you safe, housed, fed, loved. You will have everything you need. Unless you believe in lack. If you believe in lack, then you’ll get lack. Isn’t it better to believe in abundance? Someone once said – Enough is as good as a feast. It’s the kind of pithy aphorism you used to find on daily desk calendars. But it’s actually true. “WE ATTRACT WHAT WE FEAR THE MOST” – Wow!! but truer words have never been spoken. I had heard that in different forms for a good part of my adult life. We also attract that which we want, that is as long as we are confident it will come our way. Both are examples of the “law of attraction”. We have the freedom to attract what we fear or what we desire. I, prefer to attract the desire rather than the fear. Very good post, Bill – really gets one thinking. but so many of us, myself included – 🙂 – often phrase it the wrong way. Oh, and that picture………..Thank goodness I’m leaving on September 15th – Camino Envy is building within. 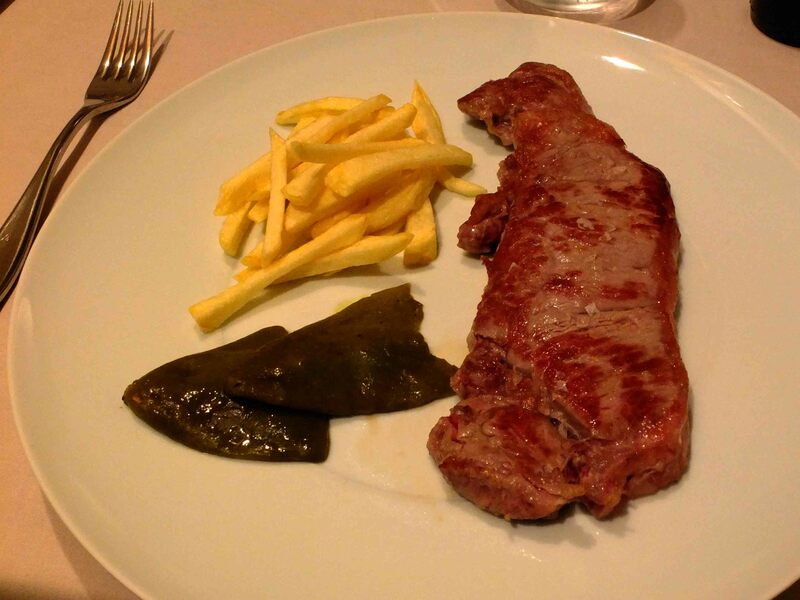 haha – Arlene – that was there in comparison to the feast I had with the �68 steak! that’s the kind of meal you would get as a pilgrim’s meal. Haha – I must be older than you!!! I look around me and I lack for nothing. I am well fed (too well fed), clothed, have shelter and too too many toys. Yet…I just spent a few dollars at the local grocery on PowerBall tickets. Is it greed that drove me? The lust for new toys? (I have a list 😉 Gluttony? More more more when I don’t need more more more. Sloth, because if I won the PowerBall I wouldn’t have to work for a living?? hmmm. p.s. What is at the 8 o’clock position on the plate? The fries (chips) and meat product I can identify. The brown things I can’t. Enlarged they kind of look like, well primitive newt heads. It’s grilled pimentos, or green peppers, that’s right. they were yummy! And good that you’ve deflected some of the more pernicious of the Seven Deadly Sins…!! Are they Padron Peppers? Those were positively yummy! Not sure of the exact name – but yes, they just melted in the mouth. I’m going to be off the blog for several hours today – driving to Sydney, on my way down to Hobart, in Tasmania. There is a very wonderful art gallery down there called MONA, which Jennifer and I will visit on the weekend. So if I don’t respond to posts and comments, that’s the reason – four hour drive to Sydney! Love Mona’s invitation to shop on web page. MONA looks interesting. I love museums, we have a few here in Tucson, but nothing looks like MONA’s website. Hey who knows, maybe someday, I’ll get to see it first hand. It’s meant to be very special. Privately funded by a multi millionaire! WOW, MONA’s on my list of must-do’s; trying not to be envious here! Please give us a run-down after your visit – and I concur with everyone else that you have yet again come up with something so thought-provoking and it’ll keep the rest of us occupied whilst you guys travel to Tassie!! Enjoy the Apple Isle. If you get a chance, there is a wonderful exhibition in Hobart at the Cascades Female Factory. Christina Henri established “Roses from the Heart” which is a creative tribute to the 25 556 female convicts who were transported to Australia. Many of these bonnets were made by descendants of the convicts. Check it out at http://rosesfromtheheart.tumblr.com Jen may be interested. The blog today was just stream of consciousness stuff this morning. Thanks for the tip on the bonnets. You’re right, Jen might well be very interested. She’s an avid quilter! Quilting is often my sanity saver. There is something special about putting together lots of small pieces, complete with the pain and anticipation, to make an object of beauty. It’s a bit like life, really. All our small endeavours go together to make the fabric of life, through which we warm, support and provide comfort for others. Please pardon the interruption Anne, but reading how you feel piecing and giving quilts reminded me of how I feel making prayer shawls out of scraps of wool.What gets to my heart every time is how appreciative people are to receive them. Just some bits and pieces put together with love can really touch someone. Bless your heart! -and yours, Jen. Quilting takes such patience, and produces such works of gorgeous, unique fabric art -you have my sincere admiration! You and Jen should get together then because she’s been quilting for about 20 years and has done some amazing stuff. She gets enormous creative satisfaction from it.